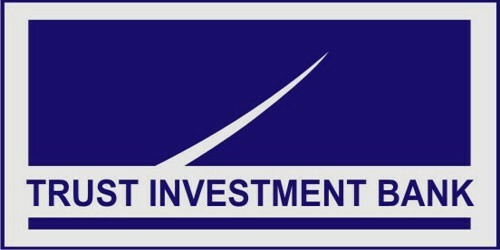 It is a broadly described annual report of Trust Investment Bank Limited in the year of 2013. During the financial year, Total assets of the Bank stood at Rs. 4,453,529,572 billion as against at Rs. 3,868,795,273 billion. The Share capital of the Bank stood at Rs. 892,028,729 billion. Total revenue of the Bank decreased to Rs. 63 million as against Rs. 253 million at 30th June 2012. During the year, Operating profit/(loss) before provisions and taxation of the bank Rs. (85,861,307) million. The Bank posted Profit/(loss) before taxation Rs. (139,083,531) million. In 2013, The Bank achieved Profit/(loss) after taxation Rs. (139,481,580) million. Earnings per share (EPS)/(loss) of the bank for the year ended 2013 is Rs. (2.47) compared to Rs. (17.93) as at end of the year 2012. The Board of Directors of the Bank has not recommended any cash dividend and stock dividend for the year ended 30th June 2013.